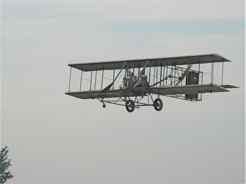 The Wright Brothers... their name goes hand in hand with early powered flight and antique aeroplanes. They weren't antique at the time, they were on the cutting edge of technology.... were they ever! ...But Dayton, Ohio has to be on your "must see" list if you're interested in aviation history. You can visit many of the significant areas. Tour one of the bicycle shops where they learned to build aeroplanes. See the house where they lived. 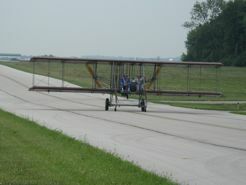 Visit Huffman Prairie Flying Field where they tested airplanes after their successful flight at Kitty Hawk. 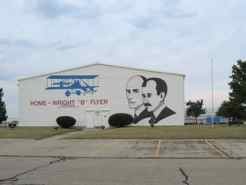 So... You need to know about the dedicated folks at The Wright B Flyer organization. They are a non-profit corporation dedicated "to the preservation and re-enactment of the historic achievements of aviation." 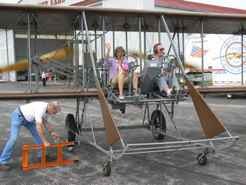 They have what they call a look-a-like aircraft (rather than a replica) of the Wright "B" Flyer (also known as the Wright-Brother's Model B Military Flyer.) 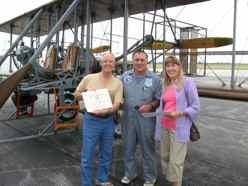 There were two, and they are working to get back to that.... see the story at Wright B Flyer lookalike. The museum (basically the hangar) is open Tuesdays, Thursdays, and Saturdays from 9:00 AM to 2:30 PM. You can visit at other times by appointment. It is free of charge, but they willingly accept (and need) your donations. You can also become a member of their organization. They sometimes take adventurous passengers on a short flight... "A brief orientation flight is available for Wright "B" Flyer Honorary Aviator Members." A short flight... short as in just lift off, fly down the runway and land... no turns for passengers due to insurance purposes. You only get up to about 65 feet, but let me tell you, when you are sitting on that wing, it seems like you're much higher. You should contact them to see when they might be flying it and make arrangements ahead if you want to try for the flight like we did. ...complete with a toothpick to get the bugs out of your teeth! We get the certificate and the toothpick! Whether you want to learn about Orville and Wilbur themselves..
Dayton and the surrounding area is a great place to see a broad range of them all.